Built in 1834, Quinta do Tua belonged to Dona Antónia Adelaide Ferreira and then Cockburn’s, before the Symington family aquired it in 2006. The quinta has a charming house looking across the mouth of the Tua River towards Quinta dos Malvedos, and some of the finest and most well-preserved stone walled terraces in the region. Quinta do Tua is situated on the east bank of the Tua River where this tributary joins the Douro river. The old stone walled terraces behind the house face southwest, but the majority of the vineyard faces full south over the Douro River and together with the consistent climate in this part of the valley results in the production of fully ripened grapes and very high quality wines in most year,s. The soil’s main component is schist. Given the extremely old vines on the property and correspondingly low yields, the Ports produced have a fine degree of aromatic concentration and tannic structure, ideal for producing classic Vintage Ports. The grapes from Quinta do Tua are vinified at nearby Quinta dos Malvedos, in modern lagares. The house at Quinta do Tua has an unusual place in the history of the Douro: Dona Antónia Adelaide Ferreira used it as a staging post in her travels to and from her properties further east in the Douro Superior, and also very graciously allowed other travellers to use the property for the same purpose, so much so, it became known as the Quinta dos Inglezes. 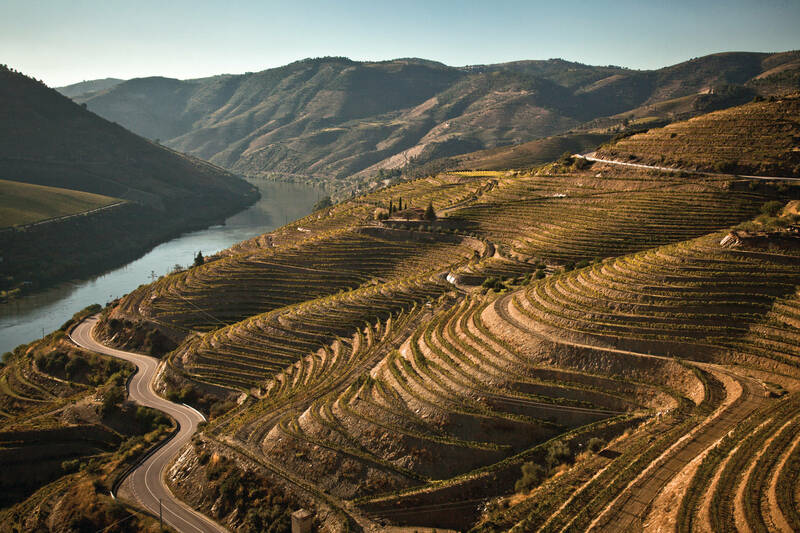 The first experimental vineyard at Tua was planted in 1930, and research projects included some of the first single-variety plantings in the Douro. In 1973 the adjacent Quinta da Chousa was acquired and since then both properties have been managed as one. The quinta encompasses a total area of over 100 hectares, between altitudes of 150 to 350 metres. The vineyard behind the house was constructed in the 1890’s and features monumental stone walls over a metre wide and. All of the property is A-rated, the highest possible quality designation, and much of the rest of the property is old terraced vineyard that was converted to olive production after phylloxera.